The other fabulous thing? It's not too hard to find, and I've found it to be relatively inexpensive (depending on the piece). 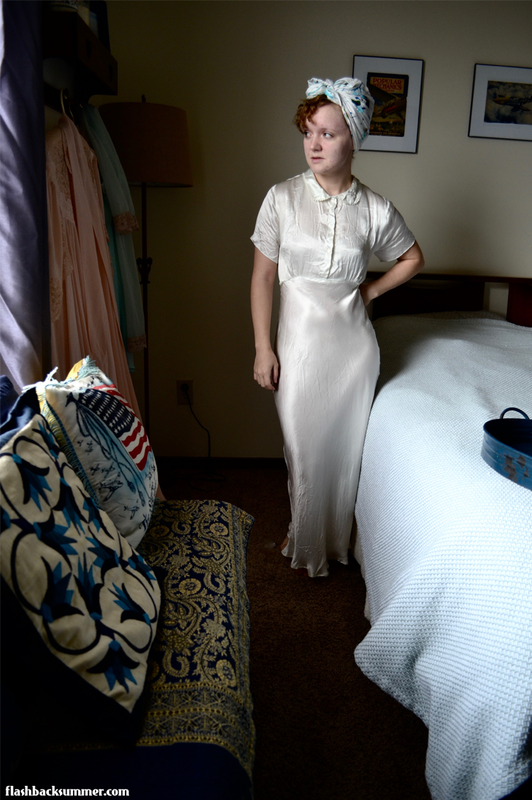 I have a growing collection of 1930s and 40s nightgowns, and there's only one that I've paid over $20 for. The one I'm wearing here today I think I found in a flea market. With a cleaning and a small mend, it was ready to go! It's made of silk charmeuse, and if you've ever worn that fabric you know that all others feel like sandpaper in comparison. It's the softiest, drapiest, loveliest fabric ever. Super comfortable and elegant to wear. It does wrinkle if you look at it wrong, but the way it feels makes it worth it! I also love 1930s gowns because they're usually cut on the bias. They cling without being tight and have some give for when I'm moving around. This one has a cute little peter pan collar and buttons down the front. The morning I took these photos I had just showered, started a new skin care regimen and left off the makeup, and pin curled my hair. I settled in for a day of relaxing and blog work at home, and it felt especially lovely to wear this gown while I did it! 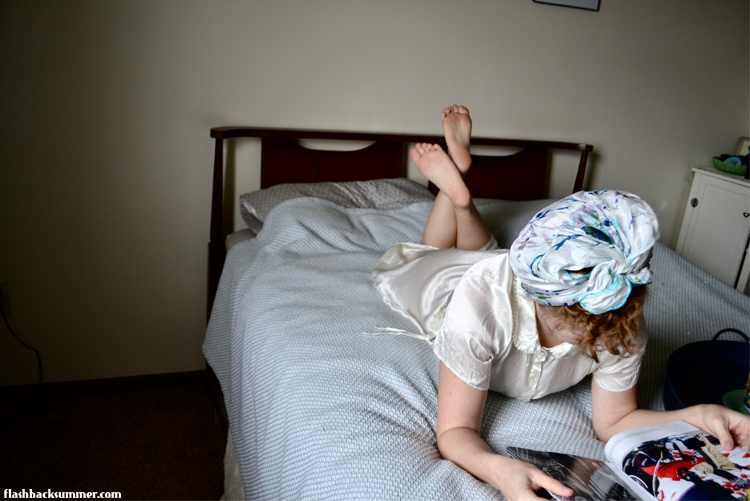 I'll be sharing more of my loungewear in this "Lovely Lounging" series in the future! 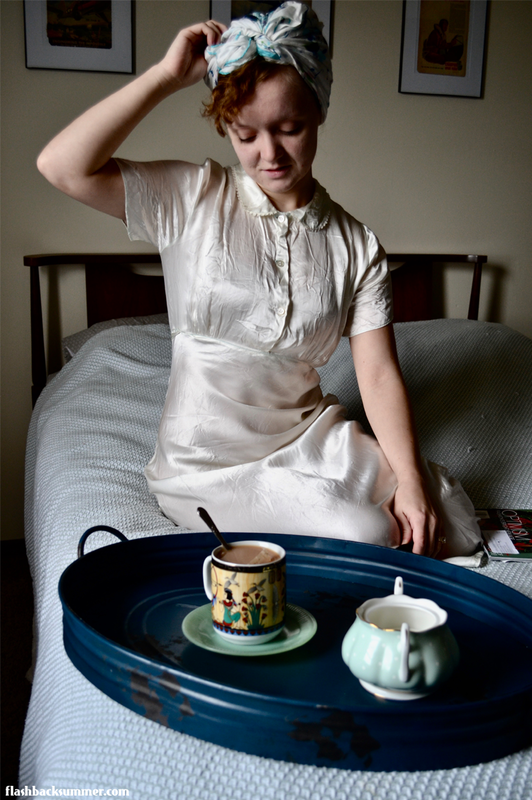 Do you have any vintage loungewear you especially love? (Feel free to leave a link if you've posted it!) What is it about vintage pieces that melts your heart? I have a few nightgowns and dressing gowns, they are so comfortable and fun to wear around the house on lazy days or when the winter weather is bad and I get to work from home for the day. I practically live in my long quilted robe during the winter months! My lounge wear weaknesses are Daniel Green slippers (I have a small collection) and 30s silk satin pj pants! 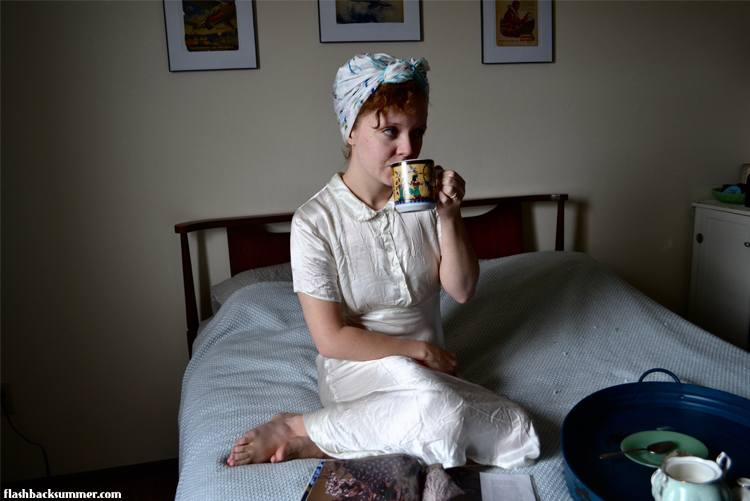 Hard to believe but I think I've only blogged about my vintage lounge wear once, in this post http://vintagevisions27.blogspot.com/2015/09/a-leisurely-labor-day-weekend.html This gives me all kinds of ideas for future posts, though I'm not sure how comfortable I feel posing for pictures in some of my vintage nightgowns for a blog post! Ha, yes, I will not be posing in all of the outfits! I'll be just sharing some details of others. (I'm a married pastor for heaven's sake! Awkward!) I was cool with this one because it shows... nothing. And 30s silk pajamas?! Those sound amazing! I'm also going to check on your link now! Oh gosh, my loungewear collection is seriously embarrasing. Does vintage count if it's something I've had for 10+ years? Haha. You have inspired me to try and expand my loungewear collection, though! Your gown is beautiful and so comfortable looking. Haha, mine has been unintentionally growing. People have given me pieces here and there, and I have even gotten some for free with other purchases. It's a happy accident, though! I plan to continue it! That's so pretty! Having something pretty to wear for lounging, etc really does wonders for my mood. I'm home with two small children all the time, and I've been trying to make an effort to at least put on matching bras/underwear. It makes me feel that much better, even if I'm wearing peanut butter stained leggings on top of them. Haha, yes, Evie! I'm not a mother, but I've heard other mothers say similar things. You are worth the effort, and a mom that takes care of herself can take care of her children better! I had a bias cut, peach some kind of fabric with ecru lace nightgown that came from a thrift store for a dollar or something. Then a while after I found it, I found a bed jacket that was the same colors although obviously much newer. I outgrew it years ago; not sure if I still have it around anywhere. I also have a quilted, light blue robe with bead and embroidery trim. I love it; even though I outgrew it, too, I dream that someday I'll fit in it again! I love this look! 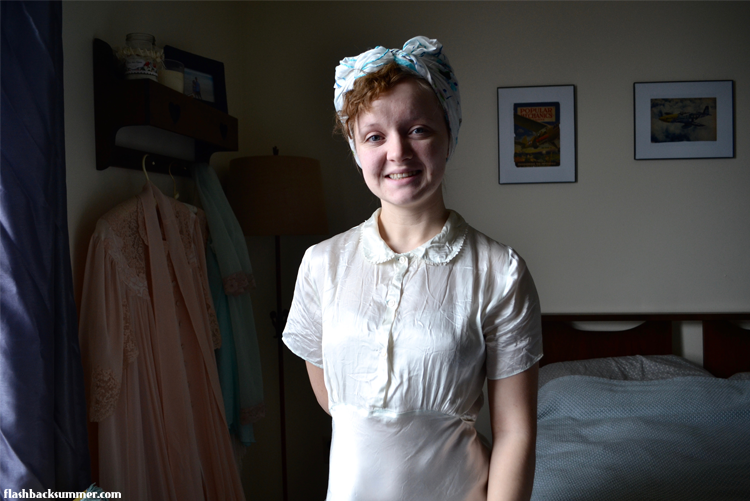 Adorable, chic, and very sweet, with the gorgeous nightgown and headscarf. 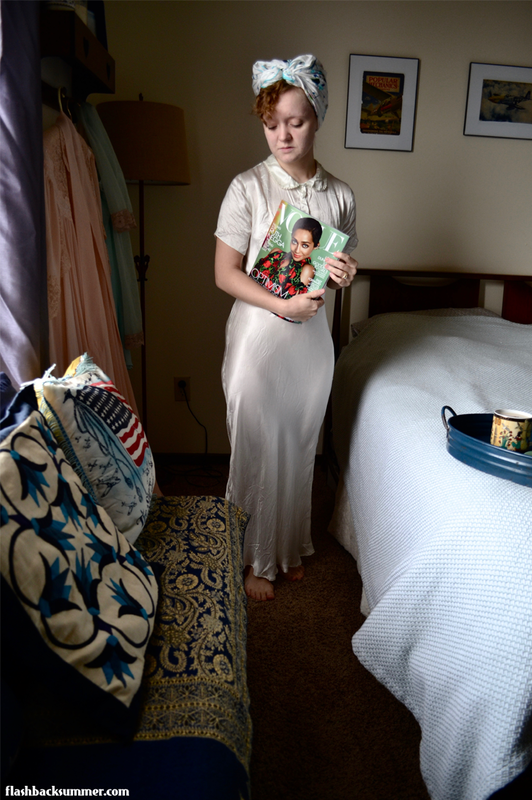 I have a couple of vintage nightgowns, but they're more of the short babydoll style. I would love to find some longer ones, like this, for lounging around the house in the evenings. Hey Ashley! I hope to do a round-up of loungewear companies soon. Until then, Maddy James could be a good place for you to start!